Picotech Overbed Table represents everything you want in a traditional and sturdy mobile bed table. You'll fully appreciate the enormous support and utility this table offers you. Being bedridden no longer needs to be an unfortunate situation that incapacitates, or prevents you from carrying out business or meaningful personal activities that add a measure of independence and achievement to your daily life. The table rises and lowers easily, making it user friendly for all ages and needs. The swivel casters make it extremely lightweight and comfortable to move from one position, or room to the next. Once your desired height is reached, the table top locks firmly and safely into place. • Includes a 4-wheel caster with integrated safety-locks allowing you to take full advantage of your product mobility without scarifying stability. It's an ideal rolling table to keep at your bedside or use with your wheelchair for everyday activities throughout the house. • Easy to assemble, average time 10-20 minutes. 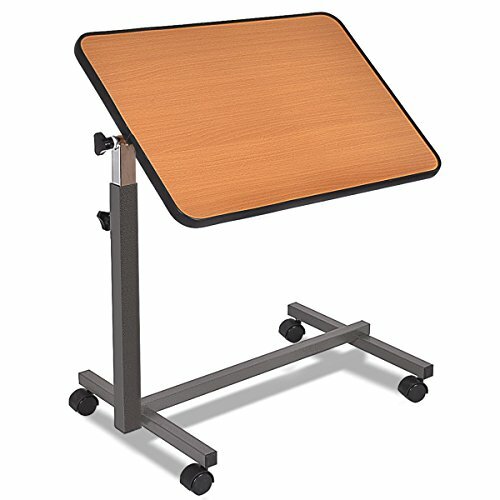 • Tabletop adjustment height: 27"-44"
• Tabletop size: 16" x 24"
• Overall size: 26.5" x 16.5" x 27"-44"
If you have any questions about this product by Picotech, contact us by completing and submitting the form below. If you are looking for a specif part number, please include it with your message.